Top 5 Water Purification Methods - Complete Guide. Top 5 Water Purification Methods – Complete Guide. 5. Removal of Tastes and Odors. Various water purification methods are used to take water safe and attractive to the consumer. The method selected depends mostly on the character of the raw water. Much of the suspended material can be removed in a sedimentation basin, where the larger particles will settle under the action of gravity. This process is called plain sedimentation. The effectiveness of sedimentation may be increased by mixing chemicals with the water to form a flocculent precipitate which carries the suspended particles down as it settles. This process is called chemical coagulation. Some of the finer particles in the water may still be in suspension after sedimentation. A large portion of these can be removed by filtration. Filtration is almost always preceded by sedimentation so that the filters do not become too rapidly clogged. Turbid water should be clarified by chemical coagulation and filtration. Since pathogenic bacteria may pass through both the sedimentation basin and the filter, disinfection is essential. Disinfection (the killing of harmful bacteria) is usually achieved by chlorination. Water which has been treated by sedimentation, filtration, and disinfection will be safe but not necessarily attractive. Unpleasant tastes and odors in water may have to be removed by aeration, the addition of activated carbon; or other means. Hardness in water may be removed by a process known as softening. Whether or not water should be softened depends on its hardness and intended use. …and reduce corrosive action; and recarbonization, the addition of carbon dioxide to prevent the deposition of calcium carbonate scale. Here you’ll find all the above water purification methods in details. The rate of settling of a particle in water depends on the viscosity and density of the water as well as the size, shape, and specific gravity of the particle. Warm water is less viscous, and a particle will settle more rapidly than in cold water. Suspended inorganic particles found in water have a specific gravity ranging from 2.65 for discrete sand particles to about 1.03 for flocculated-mud particles. The specific gravity of suspended organic matter ranges from 1.0 to about 1.4. Chemical flocs have a similar range of specific gravity depending on the amount of entrained water in the floc. Water purification by sedimentation aims to provide conditions such that the suspended material in water can settle out. Storage reservoirs serve as rudimentary sedimentation basins, but because of density currents, disturbances caused by wind, and other factors they cannot always be relied upon to give proper clarification. Sedimentation basins constructed for the specific purpose of removing suspended material from the water are generally of reinforced cement concrete and may be rectangular or circular in plan. The retention period (or detention time) is the average time required for the water to flow through the basin. In order to get a fairly high percentage of removal of the suspended material, it is desirable that the basin is properly designed. Read More: A Detailed Guide on Reciprocating, Rotary, Air Lift, & Jet Pump. If the suspended solids of water are fine or colloidal in size, chemicals are often used to effect more complete removal of the suspended matter. The coagulants react with the turbidity particles to form a flocculent precipitate The most common coagulant is alum [Al2(SO4)3 . 14H2O] which reacts with the alkalinity in the water to form an aluminum-hydroxide floc. If the water does not contain the required alkalinity, it may be necessary to introduce lime (CaO) of soda ash (Na2CO3) in addition to the alum to get proper flocculation. Activated silica, sometimes added to the water, provides nuclei for floc formation. In the process, the finely divided colloidal suspensions are converted to settleable solids by agglomeration. The individual floc particles collide with one another, and flocs of increasing size are formed. In quiescent water, the flocs grow slowly. Flocculation is enhanced by gentle agitation of the water to increase the collision rate. Violent agitation is detrimental as flocs will be disintegrated by the high shear forces that are produced. The usual dosage of alum will be 10 to 40 mg/l (approximately 80 to 300 lb per million gallons). The amount of auxiliary chemical used depends on the character of the water. Ferrous sulfate (FeSO4) and ferric chloride (FeCl3) are also used as coagulants. They form iron hydroxide precipitates. The ferrous salt requires the use of lime as an auxiliary chemical, or it may be converted to the ferric form by addition of chlorine. The amount of chemical used is found through trial by placing samples of the raw water into a series of jars and adding different amounts of chemical to each. After a few seconds of vigorous mixing and several minutes of slow mixing, the character of the flocs and their settle-ability are observed, and the optimum dosage is selected. Since the quality of the water may change, it is desirable to conduct the test frequently. At some plants, this may be done several times a day; at others where the water is less variable, only once every few days. Chemicals can be fed into the water by a solution-feed machine or a dry-feed machine depending upon the nature of the chemicals used. his is most commonly achieved by mechanical means with rapidly rotating paddles in mixing chambers having detention times of 30 to 60 sec. The hydraulic jump is also an effective mixer, but it may not be feasible over a wide range of flow rates. The flash mix must be followed by a 20 to 30-min period of gentle agitation to permit flocculation. Flocculators consisting of large slowly rotating paddles in relatively deep basins are best suited for high-capacity plants. A baffled chamber through which the velocity of flow is about 1 ft/sec will also provide a suitable environment for flocculation. If carefully controlled, sedimentation with coagulation will remove about 90 percent of the suspended solids. Various manufacturers have come out with packaged units, generally circular in plan, which will provide clarification of water, through sedimentation with coagulation. These units are particularly suited for small installations. Flexibility in the operation of sedimentation basins may be had by using several units in parallel. With such an arrangement one or more may be operated depending on the flow and shut down for repairs or cleaning if necessary. The usual filter consists of a layer of sand or crushed coal supported on a bed of gravel. When water passes through the filter, suspended particles and flocculate material come in contact with the sand grains and adhere to them. This reduces the size of the water passages and a straining action results. Bacteria are effectively removed by filtration. In time, more and more material is trapped in the sand bed, the pores clog up, and the hydraulic head loss through the bed becomes excessive. Watch the video below to understand water purification methods more efficiently. ..and the material that had been filtered out of the water is dislodged by shearing action and carried off in the wash-water troughs. Water jets directed at the surface during backwash are often employed to free the grieved material from the sand grains. …the period of backwash is generally 3 to 5 minutes. The amount of water required for washing a rapid sand filter varies from 1 to 5 percent of the total amount filtered. The filter must be backwashed every 1 to 3 days. The wash-water is usually wasted to a sewer or stream, although sometimes it is discharged into a reservoir for later reclamation. Various types of filter under-drains are employed in rapid sand filters. Perforated pipes are widely used for this purpose. A typical installation might consist of a 16 inches diameter manifold pipe running lengthwise along the center of the filter bottom. Taking off from the manifold in both directions at right angles to it would be 4 inches laterals with 1/2-inches holes in every 6 inches. The holes are placed near the bottom of the pipe to prevent clogging. Filter blocks, metal gratings, and specially patented filter bottoms are also used. A designed filter bottom will give a uniform distribution of wash-water. This will prevent mud balls from forming in the filter and lead to more affective filtration. A vigorous surface wash prior to backwashing is also used sometimes to prevent mud-ball formation. In order to achieve uniform distribution of wash-water, the filter units should not be too large. From experience, it has been found that a 24 to 30-inches layer of sand with uniform grain size (0.35 to 0.45-mm diameter) gives best results. The sand is frequently supported by a 12 to 18-inches layer of graded gravel. The usual rate of water application is about 2 gpd/sq.ft. The discharge line from the filter is provided with a rate controller, a throttling device to maintain a uniform rate of flow through the filter. Too high a rate of flow, particularly immediately after backwashing, would permit some of the suspended material to be washed through the sand filter. The filter should be provided with a head-loss indicator. Immediately after backwashing, the head loss through a sand filter operating at the usual rate will be about 2 ft. This will gradually increase. When the head loss approaches 8 ft. the filter should be backwashed; Otherwise, difficulty with air binding may occur. Air binding is caused by excessive negative pressures in the sand bed. These permit gases to be released from the water and to lodge in the bed and under-drainage system. This reduces the capacity of the filter. At a filter plant, it is good practice to provide a regulating reservoir or clear well with a capacity of about 30 to 40 percent of the daily output so that one or more filters can be taken off line for several hours for maintenance. for mail installations, such as industrial plants and swimming pools, more filters are employed. These are closed tanks containing a filter bed through which the water passes under pressure. Read More: Earth Dam: Types of Earthen Dam and its Construction. 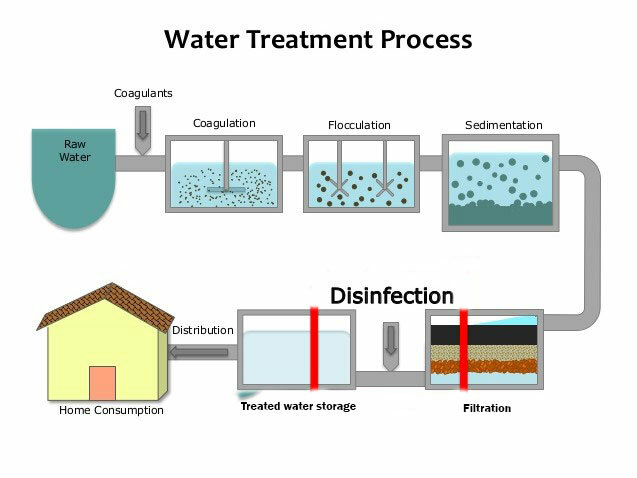 This is yet another procedure used in water purification methods. More than 50 percent of the pathogens in water will die within 2 days, and 90 percent will be dead at the end of the week. Hence, reservoir storage is reasonably effective in controlling bacteria, A few pathogens, however, may live for 2 years or longer; hence, disinfection is desirable. Chlorine is an ideal disinfectant. It forms hypochlorite when added to water, and this has an immediate and disastrous effect on most forms of microscopic life. Liquid chlorine is obtained in pressure containers and is applied to the water through a chlorinator. Small chlorinators feed the gas directly into the water, while large-capacity chlorinators usually dissolve the gas in water and feed the solution. The chlorinator should be maintained at a temperature of at least 70°F to prevent condensation of chlorine gas in the feed lines. Both automatic and manual regulators for application of chlorine are available. Some plants find it economical and safer to use calcium hypochlorite (bleaching powder) as a disinfectant. This chemical reacts with water to liberate hypochlorites as does chlorine. The amount of chlorine required depends on the amount of reducing inorganic and organic matter in the Water. In general, most waters are satisfactorily disinfected if the free chlorine residual (hypochlorites) is about 0.2 mg/l 10 minutes after the chlorine is applied. A larger chlorine residual may cause tastes, while a smaller one cannot be relied upon. Chlorine is most effective if the pH of the water is low. When a water supply contains phenols, the addition of chlorine to the water will result in disagreeable tastes because of the formation of chloro-phenol compounds. These tastes may be eliminated by adding ammonia to the water just before chlorination or by other means. The chlorine and ammonia combine to form chloramines, which are relatively stable disinfectants, but not as effective as hypochlorites. They do not react rapidly but continue their action for a long time. Hence, their disinfecting qualities may extend for a considerable distance into the water distribution system. Chlorination is practiced in a variety of ways depending on the quality of the raw water and other conditions. Post-chlorination, the application of chlorine after treatment, is the customary method. 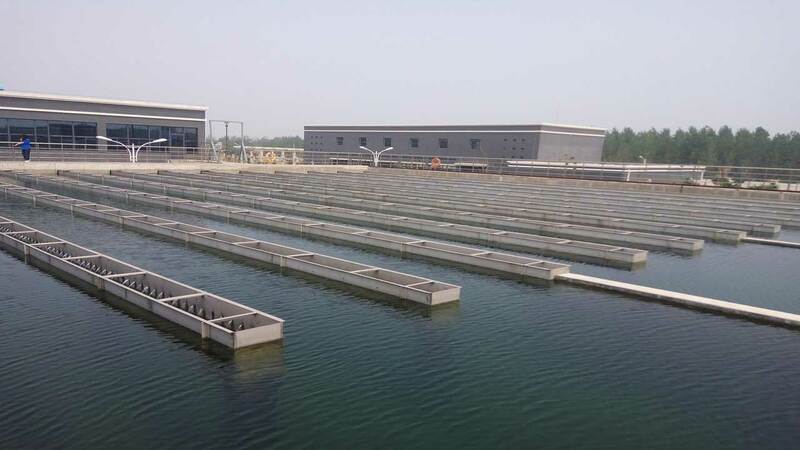 Pre-chlorination, the application of chlorine before treatment, however, improves coagulation, reduces the load on the filters, and prevents the growth of algae. Pre-chlorination and post-chlorination are often used together. Application of chlorine so as to leave an excessively large residual is known as super chlorination and is often employed to remove tastes and odors. Super chlorination must be followed by dechlorination, usually accomplished by treatment with sulfur dioxide or by passing the water through a filter of granulated activated carbon. To test for residual chlorine, 5 ml of orthotolidine solution is added to 100 ml of the sample. If a yellow color results, the sample contains chlorine residual. The deeper the yellow, the greater the residual. A quantitative determination of the chlorine residual can be made by comparison with standard colors. Chlorine frequently forms natural chloramines with nitrogen compounds in the water. These give a positive reaction in the orthotolidine test just as a free chlorine residual will. chlorine either as a residual or in combination with phenol or decomposing organic matters. Aeration, usually accomplished by spraying water from special nozzles or by permitting it to trickle over cascades, breaks the water into droplets and permits the escape of dissolved gases. Activated carbon can be used effectively to remove tastes and odors. It is made by heating paper-mill waste or sawdust in a closed retort and oxidizing it by means of air or steam to remove the hydrocarbons. The resulting product is very porous and possesses extremely good adsorptive properties. Activated carbon is sometimes used as a filter, though more often it is applied directly to the raw water in the mixing basin before coagulation. A dosage between 5 and 30 lb per million gallons is usually adequate. Chlorine, ozone, and potassium permanganate have also been used effectively to oxidize taster reducing material. Read More: Pipe System Design – Complete Guide. Thanks for Reading. If you like this article (Water Purification Methods), then don’t forget to share it.